University City has seen a flood of new student housing for some time, but some developers are building new housing for non-students, for the workers of University City and Center City. Several new towers have been built that are intended for both workers and some graduate students, but are not intended for undergraduate students. 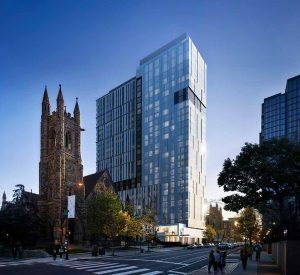 Developer EPG Urban Multifamily is planning one of those new towers at 3720 Chestnut Street, replacing the student Newman Center, which will move next door to Saint Agatha’s Church. This new tower is being designed by SITIO Architecture + Urbanism. The new tower will be 30 stories tall and have 420 rental units. The units will include studios, one-bedroom, and two-bedroom units. The first floor will have 4,000 square feet of retail space facing Chestnut Street. The residential entrance and lobby will be on the side and will lead to a lounge and sitting nook. On the second floor will be a fitness center, a meeting room, and a coworking space and study room, all above the retail facing Chestnut Street. A forty-space parking lot will be underground, with access from Sansom Street. There will be bicycle storage and bike racks outside. The front will have a granite plaza and there will be a garden courtyard on either side, designed by Studio Bryan Hanes, who is designing a “tower in a garden”. The exterior of the building will have an irregular pattern of metal panels, clear and tinted glass, and marble on the lower level. University City’s skyline is growing in many ways. Along the waterfront, the Cira Centre developments are creating a new image of University City and further west several new buildings have recently been built. Other highrise apartment developments, which are intended for workers and graduate students, include 3601 Market Street, Vue32, and 3737 Chestnut Street, which will be across the street from the new tower at 3720 Chestnut Street. This new gleaming apartment tower will fit in nicely with the new skyline for University City. Looking to rent in University City? Call 215.692.6636 or email info@thecondoshops.com.